Life has been really busy and my kitchen had been feeling pretty lonely lately, but my tummy is still filled contently. 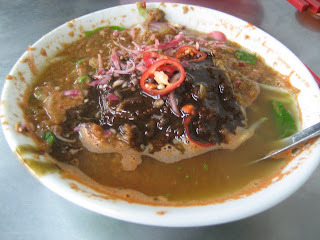 This would be my final part of Penang food endeavour, which I had held off for far too long. I hope I would be at least posting once a week from now on unlike my recent absence, for my job load is high and my weekends are spent relaxing or having fun. But I have no intentions to abandon this blog of mine, which had just celebrated its first birthday! Oh no, where is the cake? It will come, I have no doubt but when is the question. It deserves a cake (or maybe a cupcake) and a post on its own, so do look out for it. 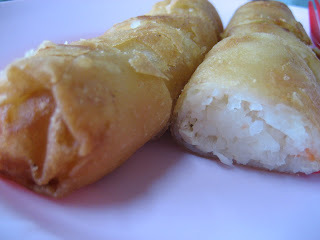 Now off you go to drool on more Penang food fare. Off we head towards the outer sides of this island, where the road is long and winding, and the sea runs along the side. We stopped halfway just to have a glimpse at the sea, though not really clean and beautiful, but still we needed a breather. Cheekily, we stopped right beside this sign, which I seen for the first time and found it pretty interesting. 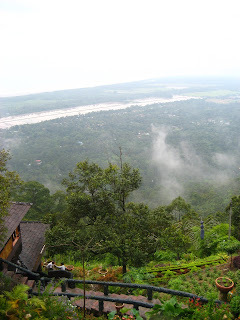 Then we head on winding around the hillsides, searching for a hill which J said have spectacular view, with lovely set up and a Thai restaurant. On the way, we passed by a huge dam, which was a good place to stop for fresh air and clean view. We continue our way to find our special hill, when suddenly we saw a huge signboard saying “Fruit Farm 1km” with an arrow pointing the way. On a whim we decided to give it a visit. 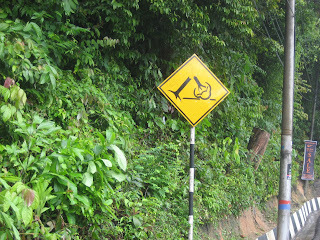 We drove up at a turning up a steep road for few turns, and then we found the fruit ‘stall’. 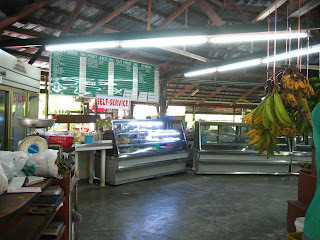 The place was packed with local fruits that are currently in season. There is also a counter which serves freshly squeezed juices and sliced fruits. 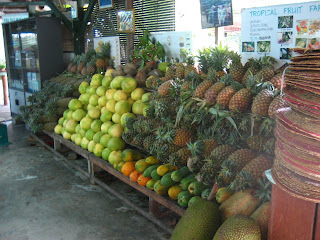 We opted to just get some local fruits, some for a friend we would be visiting later and some for us to lug home. 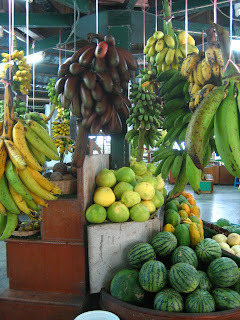 J and I was attracted to the black (or dark red) banana, which we have never seen before in our local markets back home. We enquired and the shopkeeper explains that it is nothing special in taste but the color causes many not to plant it due to superstitution. (Here locals believe that banana tree are prone to evil, thus a black banana would certainly be much worst that its yellow counterparts). So we happily bought a bunch back home to try. Off again we go in search again and finally, we found the hidden way up to Genting Hill! 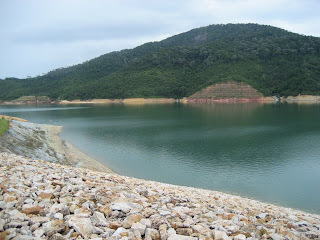 Yes, there is such hidden gem in Penang, which even most localites do not know. The way up was pretty steep and scary, especially for my little black car to brave, but we did nonetheless and were certainly thankful we did. 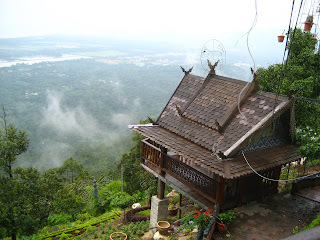 The view was certainly breathtaking, the place lively with funky designs and woodwork of Thai influences. We found that this Thai haven also offers Thai massage and reflexologies, being crazy, we decide to go for the Thai massage (we do not know what effects will it have judging we just had reflexologies few hours ago) but we came out refresh and rejuvenated. Then we sat down by the restaurant’s balcony, just a top the beautiful scene below. 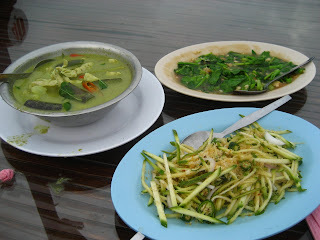 The meal was alright, just like a cross between Thai food and Mamak (Indian-Muslim) style of cooking. We had green curry chicken, which was a bit water down and with slices of chicken meat which seemed like pre-cooked and then thrown into the gravy for a little while before serving. Then the salted fish green vegetable, which I suppose should be Thai but tasted deceivingly like a Malay dish I know, and lastly was the Mango Kerabu, which was totally disappointing, nothing like the authentic tangy salad but instead very sweet (I suspect liberal sprinkles of brown sugar here). Then we ended the meal with a Thai jackfruit with chestnut dessert, which came in a really small portion, which was not too bad. It tasted real coconuty with a little sweetness from the jackfruit and chewy-crunchy jelly-covered-chestnut. Given the credit of beautiful scenery, I really enjoyed the meal. 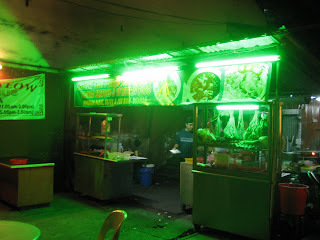 It is time for us to go back down to Penang, I am starting to miss the hawker food again. We went straight towards Kek Lok Si, to my one-and-only-favourite laksa in town. I do not need to describe more of this wonder bowl, which I had featured before. Beside this stall, there was another mini stall selling fried popiah, which we found crunchy and tasty from our previous trip. We had it as starters while waiting for our laksa. J remembered I mentioned that I wanted to try out Penang version of Chee Cheong Fun, which I learnt from L’s post long ago. So he took me to a nearby hawker stalls to try it out. 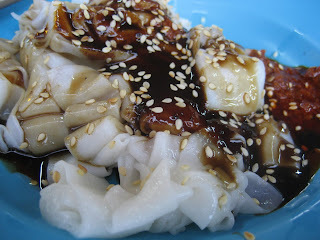 Chee cheong fun, apart from a smooth, slightly chewy and soft texture, the sauce is one of the most important part of the dish. This one comes with heavy take on heh kor (a sweet thick prawn paste, usually served with assam laksa; the black sauce drizzled on my laksa up-close shot above). Heh kor taste is usually acquired, it can be smelly to some, a taste really hard to be describe other than you taste it yourself, just like rojak. The chee cheong fun was not bad and certainly something new and different, although I still prefer the Taiping-style tim cheong (sweet sauce) best. I forgot to note down the address but it is the restaurant not too far from Kek Lok Si where there are few more with the name in numbers. This one is a corner shop with the name of a year. Our last stop is not any hawker stall or any fancy restaurant, but instead J’s friend’s house. Being a gracious host, they had prepared a full course delicious home-cooked meal, Penang style for us. Our eyes bulge at the amount of food they prepared, cursing our whole day gluttony. Yet being gracious guests too, we devoured everything, even though we were already filled to the brim. But it was not too hard as the meal was fantastic. I did not get to take much picture, as not to be rude. The picture was sneakily taken while our hosts are bringing more food from the kitchen. We had the smoked chicken, prepared specially by the lady host, which later when I asked her, she explained that the chicken was rubbed with mixes of spices and then smoked with rice and coffee beans. It was certainly the star dish of the evening; with the deep smoky flavour embed right into the bones while the meat was juicy and sweet. I can still imagine it now. Then there was the dry beef curry, with slices of daging bakar (barbequed meat) with thick curry with kerisik (pounded dry-fried grated coconut, like those in rendang). It was really addictive too. then there was the tom yam fish head, which was the huge bowl you see there, that was good and really spicy after some time. Then besides that, there was another fish dish, which was Teochew steam fish, the fish was really fresh and the simplicity of the dish brought it out. Then we also had some stir-fried vegetables to complete the meal. When we just came we chit-chat with the hosts’ son on the topic food (of course, he is a penangite after all) and he asked us what was our best meal in Penang so far, that time I answered Laksa, but after the wonderful Penang-home-cooked meal, I had to re-declare that it was the best meal I had so far in Penang! 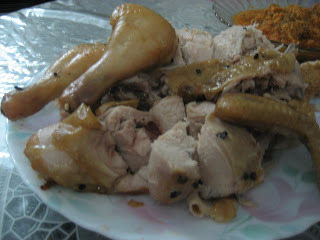 Nothing beats home-cooked meal isn’t it, and to top it off, this one is by one of the food-critics in Malaysia. After the meal we had long hours of catching up and talking about everything under the sun. Finally when we leave, we have slightly digested and did not feel like a walking wate-balloon. Then J get on with the final itenary, which is of course food, this time is for kuey teow kerang (fried flat rice noodles with cockles). 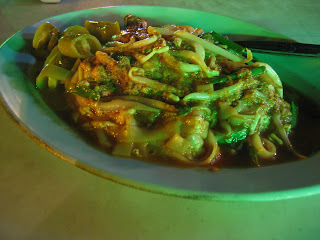 This one surprisingly is not made by Chinese, but from a Malay stall, that had adapted the infamous char kuey teow into a slightly wetter version with much much more of cockles. This kuey teow dish was certainly thick with cockles taste, though I am not a fan of it but this one was certainly yummy. It was slightly spicy with loads of fresh cockles drowning the white kuey teow, which was soft and smooth. It is certainly a dish well worth the extra space in my overload tummy. Finally when the day has ended, J and I packed into my little black car and head back home, discussing all the way about all the food we had and some extra funs we had thrown in. Definitely a trip to remember by, else my expanded waistline will remind me anyway.